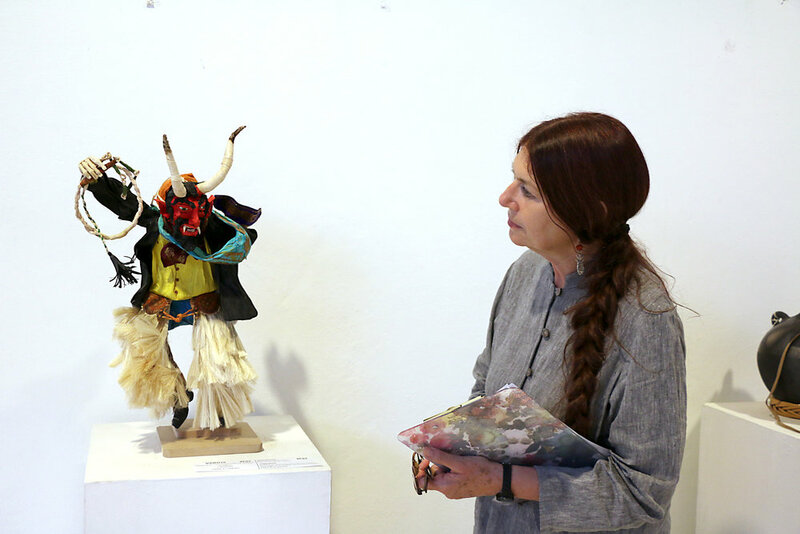 My first encounter with FOFA was in 2013 at the Museum of Popular Art of Oaxaca (MEAPO) for the contest and exhibition "Celebrating Mother Earth: Inspiration for Oaxaca’s Folk Arts". This was also my first opportunity to share my cornhusk figures (totomoxtle), which I create in the workshop that I share with my mother. She taught me how to work this noble material provided by nature. I was very pleased to receive an honorable mention in this event. FOFA’s recognition gave me the opportunity to attend their courses, including one on the History of Oaxacan Art, taught by Juan de Dios Gómez Ramírez and Emilio León Zurita. The course objective was to give artists knowledge of Oaxacan and Mexican art so that they could apply it to their artistic work. My greater knowledge of culture has been very helpful, and I have been able to apply it with great sensitivity to my folk art. This course encouraged me to continue with my education and consider a university degree. Another significant opportunity that arose from my relationship with FOFA was participating in the "Masters of Art Fair" held in Guadalajara. I am currently studying architecture and continue to work with totomoxtle, thanks in large part to the strong support that I receive from our friends at FOFA and MEAPO. I had the great experience of participating in the 2016 competition-exhibition "Honoring Our Roots, Exploring Our Dreams" sponsored by this great and responsive organization, FOFA, and our friends at MEAPO. I earned first place in this year’s event, but beyond that I have had the pleasure of seeing my work mature over the years and to assess the experience over time. I feel very happy and very proud to have met many Oaxacan artists, great teammates, great craftsmen, and above all wonderful people for whom art is a form of hope for changing a state and a country. Only the values eflected in folk art can counter the brutal side of man; folk art makes man a civilized person capable of loving his neighbor, while preserving respect. My thanks and congratulations to FOFA and MEAPO for their great efforts to help artisans and promote the conservation of folk art among young people. Long live the art of our people, the respect of our culture, our roots and long live FOFA and MEAPO. We are grateful to FOFA for the opportunity not only to receive a monetary award, but equally important to show our work. This is a beautiful form of recognition. FOFA’s impact extends to the workshops that provide support and create opportunities, not just for me, but also for my family. Thanks to the catalogue we have met many people from outside of Oaxaca and Mexico, who have become our friends. Thank you very much for making our dreams a reality. I am at your service for anything. My greetings and a big hug. The FOFA competition has enhanced my motivation to continue preserving the folk art that has been in my family for four generations. I also thank the FOFA foundation for the courses they provide. In them, we have shared experiences with fellow young artisans and knowledge about techniques we use. I want FOFA to know that because of you I have had the support to help build my dreams. The young always dream -- we all have a goal -- and for us, the young creators of folk art, our dream is to preserve our artistic roots. I am a craftswoman dedicated to creating .925 silver jewelry with the ancient techniques of filigree and cartoneado (threaded silver wire). I've been involved in the past three FOFA/MEAPO contests, the first when I was 24, the second at 26, and the most recent one at the age of 29. Participation in these contests has provided a motivation for me to improve. As the competition approaches I look forward to the call to participate so that I can give flight to my imagination and start working night and day to see my dream come true. For me FOFA means a space in which I can demonstrate and teach the work that my father, Arturo Salgado, has taught me. I am proud that my father is my teacher. I am very grateful to God for putting me where I am, and grateful to FOFA for supporting young artists by opening these competitions and trainings that drive us to want more, to not get stuck, and to move forward. My goal is to continue to participate, keep learning, studying other techniques and designs, and of course to continue to show my work so that my son and husband continue to be proud of me. Thank you, FOFA, for waking us up. I am delighted and impressed to see the quality of the work in all categories of contests of Oaxacan popular art. My congratulations go to the many artists who present their works of art. These highly skilled young artists are keeping Oaxaca’s rich visual heritage alive, while bringing to bear their own highly personal vision. Thank you FOFA and MEAPO for your commitment in organizing these enormously important events. Participation in contests sponsored by FOFA and MEAPO deeply enriches my spirit. It is rewarding to see so many well-crafted pieces and impeccable techniques deeply rooted in each artisan’s people, to be able to carefully appreciate every detail, every texture, every color, every step, and the care taken to preserve ancient techniques, innovating in some cases or in others updating their creations without losing sight of the profound source of all creativity. The Young Folk Artists’ Contests organized by FOFA are the most innovative of Mexico. Their format focuses on a clearly defined objective: to incentivize the winners and to accompany them during the subsequent years by offering tools for life and expanding creativity. Based on needs expressed by the youngsters, the scholarship component has varied: art courses or tutorials in artists’ studios, English, and tools to promote their work through the internet, such as web design and photography. Through evaluation and follow-up interviews the impact of the program is analyzed to improve the following contest. All agree that the “cherry on the cake” is the catalog produced after the contest, as it makes the artists visible and serves as an important form of promotion. As a member of the jury it has been satisfying to see the effort the participants put into their work to outdo themselves. In a story that re-invents itself, perhaps one of the aspects that most surprises me is the emergence of children and young people whose dedication to folk art is by vocation, the existence of such work in less traditional communities and/or the use of different mediums of expression. Several examples are bone carving in Miahuatlán, and the combination of cornhusks with split cane and the flor inmortal (figures made from dried flower). These pieces intertwine with the most identifiable, traditional expressions of Zapotec culture in the Valley.